Few types of floods can be as damaging to your Ebensburg, PA, commercial building as a sewer flood. Black water and other sewage contents may erupt from a backed-up sewer or after a violent storm that causes local drains to back up. However, when sewer damage affects more than one floor of your building, the results can be even more serious. A water damage and cleanup company may be able to offer you a variety of services in this type of situation, no matter the severity of the flood. A professional flood damage service may be able to connect directly with your local sewage company so that workers there can be made aware of the problem. Service people may even be dispatched to your building so that sewer lines and shutoff valves can be located and utilized. Once flood sources are closed off, further mitigation can begin. Once your building is evacuated, flood technicians will probably bring in a variety of machinery to drain away contaminated water. Portable sump and trash pumps will likely be used to drain away any raw sewage within the water, such as in the case of a flooded toilet. If floors and ceilings have been noticeably weakened by the flooding, these areas may be sealed off until tear-out proceedings can begin. Multi-level sewer damage can severely cripple a building if restoration is not performed properly. A certified sewer flood and repair company has the know-how and resources to tear out soaked flooring and ceiling material, as well as drywall and soaked insulation, so that it can be properly replaced. Replacing these items on each floor can help ensure employee and customer safety and remove lingering odors sewer water can cause. Sewer damage can devastate your Ebensburg, PA, commercial building. 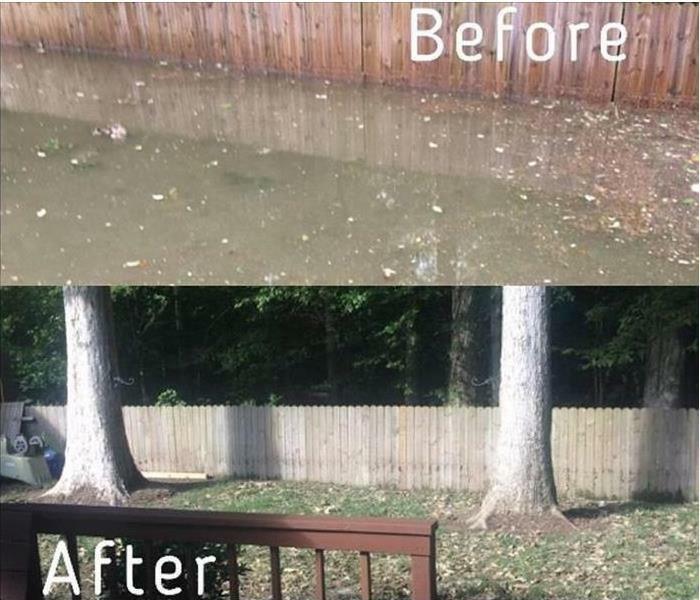 Connecting with an expert flood cleanup and restoration service can help you recover faster when this occurs and help you feel confident about the future of your business. Water damage is an unfortunate accomplice of floods, fires and significant plumbing failures. Left untreated, it can lead to a catastrophic outbreak of black mold. Hidden plumbing leaks and storm damage are worse. They can go undetected for long periods. By the time someone reports the problem, the water and mold damage can be extensive. The secret to dealing with a mold or a moisture problem is to address it quickly and thoroughly. Consider the following three-step proactive approach. 1. Perform routine water damage and mold inspections. Don’t depend on someone noticing and reporting a water or mold problem. Divide your business into zones and set up an inspection schedule. Train your maintenance personnel to perform the inspections. The first round of zone inspections should happen quickly. This will identify the initial water and mold problems. Future cycles will identify newer problems. 2. Adopt a zero-tolerance policy toward every moisture problem and black mold outbreak. No leak is too insignificant to repair. 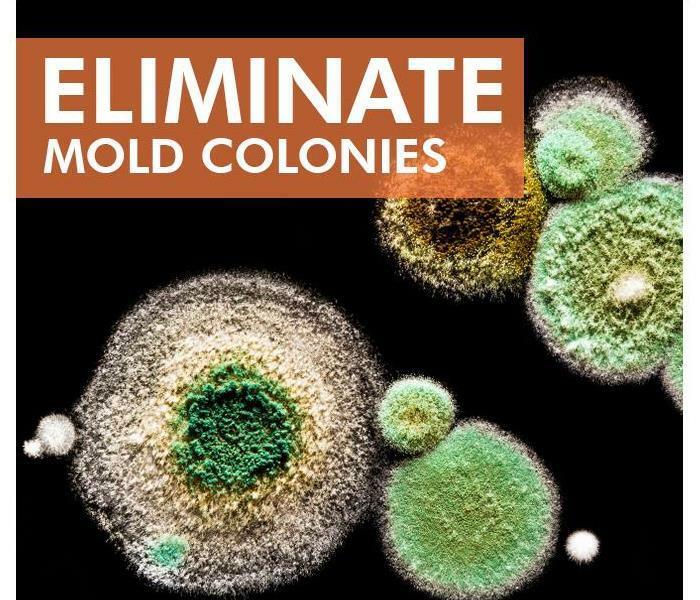 No mold colony is too small to remove. The longer you wait, the more difficult and costly these problems become. 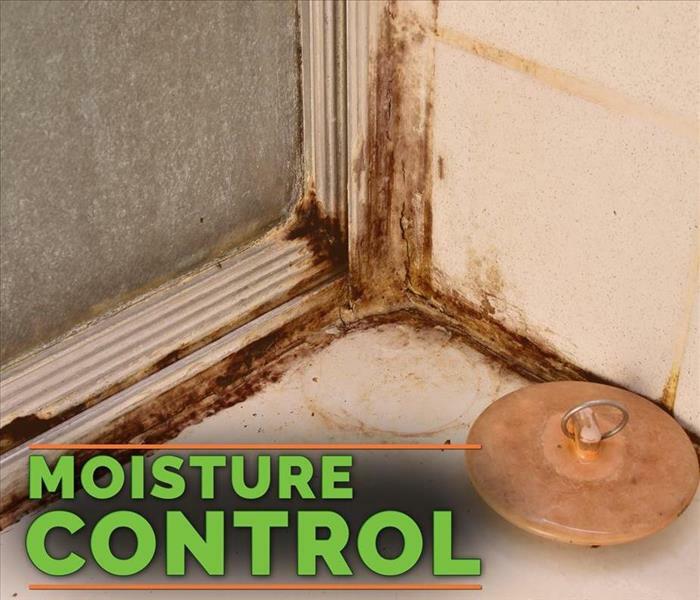 If the moisture and mold are already out of control, get help. Bring in professionally-trained water and mold remediation experts. You will find them in the Belsano, PA, area. They are ready to eliminate your moisture problems and perform the mold cleanup. 3. Make your business less hospitable to mold. The primary key to avoiding mold is moisture control. Plumbing leaks, standing water and humid air are all invitations for mold growth. Modern buildings are air-tight by design. Humidity can reach unacceptable levels. Businesses that make extensive use of water may have an unavoidable humidity problem. In all cases, the goal should be to keep humidity below 50 percent. Better ventilation or a high-performance HVAC system can help. Water damage can be devastating to a business. Black mold can be disastrous. It’s better to deal with these issues proactively than it is to wait and struggle with them later. 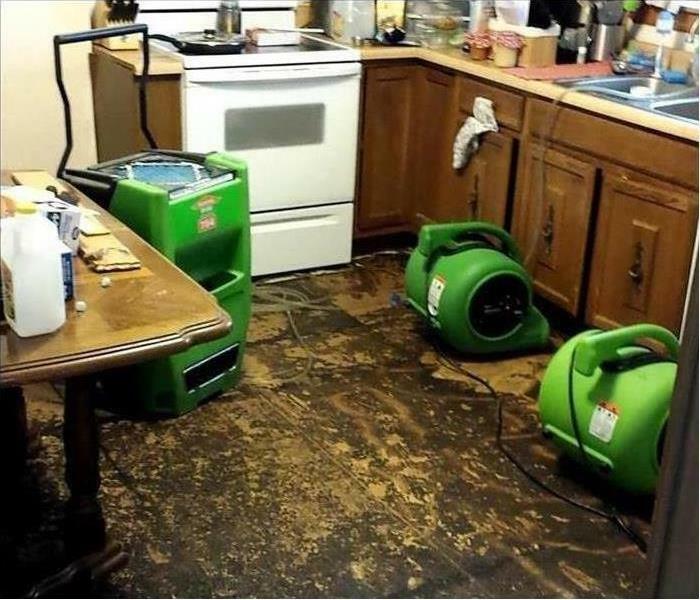 Kitchen flood in a Gallitzin, PA home. 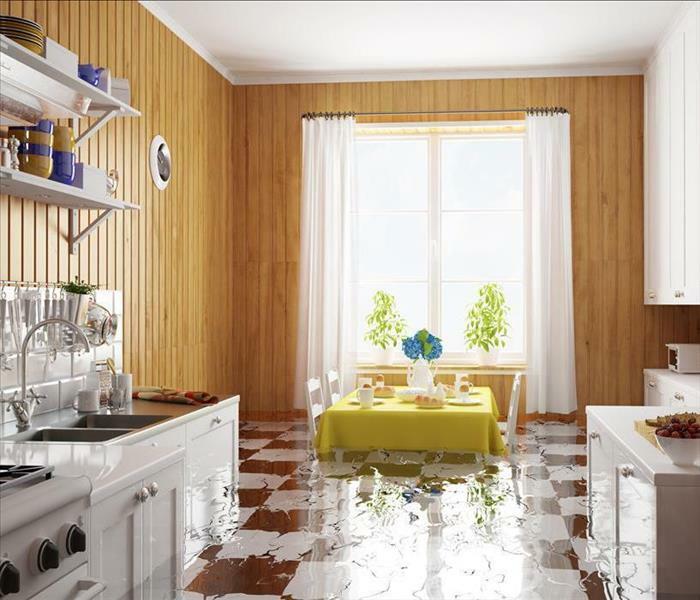 Stepping into your kitchen to find a water covered floor can be a homeowner’s worst nightmare. Knowing what steps to take as soon as you find the water pouring out from under the sink can help you mitigate the damage to your home. Here are five steps to take in the first three hours after a kitchen flooding occurs. After you turn the water valve off, sop up the water with towels, collect the water with buckets, or sweep the water out the door with a broom. Mold can begin to grow from having unwanted water in your home in as soon as 24 hours, so it is essential to remove the water yourself or call a water mitigation team. Anything that was on the floor, and is now wet, needs to be sorted. For example, pet food should be thrown away, but the pet’s bowl can be cleaned and saved. So, make a pile of items to discard and another pile for items you are going to keep. Your floors will quickly soak up the flooding water, so it is important to protect your furniture from the soggy floors. One way is to place your items on blocks, while another is to place a foil or plastic barrier between the furniture and the floor. Once the water is gone, turn on fans or dehumidifiers to remove the residual moisture from the air. If it is summer in Gallitzin, PA, an air conditioner can help ventilate as well. If you have precious keepsakes or heirlooms in the flooded area, consider relocating them away from the moisture packed air in the kitchen. The dampness can encourage mold and mildew growth. After the flooding water has been dealt with, you can probably begin to worry about the minor kitchen repair associated with floodwater. It may also be a good idea to contact your insurance company and let them know you have a mitigation team to help you document the chaos. Any time your clients’ businesses are damaged by storms, fire or flooding, you can expect them to file an insurance claim. If the company that does the repair work has an electronic record system, you have a wealth of information available to verify the information you are given. The Claims Information Center goes beyond offering a list of services and costs. Here is a list of the types of data you can expect from an electronic claims service. When you access a file on the CIC, you can see exactly what the local SERVPRO team finds when it conducts the damage assessment. 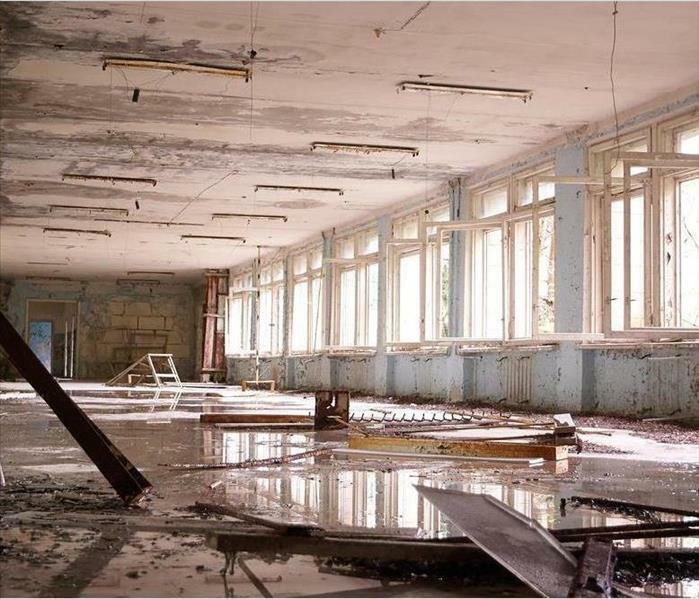 Knowing the type of damage in your client’s building in Vinco, PA, can help you determine the extent to which the policy covers the repairs. To further help you discern whether the client’s insurance claim can be approved, you need to know what caused the damage to the property. Some policies cover fire and water damage but not flood damage from a storm. Having the information readily available makes processing the claim easier. When an insurance agent logs in to the CIC, the case file should contain an itemized list of damages and labor, complete with each item’s cost. Rather than have to wait for a hard copy of the report, you can see what restoration is likely to cost at any point in the process. SERVPRO wants you to know that you are getting excellent service. The electronic records system lets you compare the response time and service of its certified mitigation experts on both a regional and national scale. Processing an insurance claim for the damage to your client’s commercial property becomes much simpler when you have access to an electronic claims service. You can get all the information you need to serve your client efficiently. This kitchen was rebuilt after it suffered water damage from a leaking pipe. SERVPRO of Ebensburg was there every step of the way. Experiencing Any Kind of Loss in Your Home or Business Can be Very Stressful. No one wants their lives to be flipped upside down due to a water or fire loss. Many customers dread the thought of having to deal with another contractor to get their lives back together after a fire or water loss. SERVPRO of Ebensburg provides a One-Stop-Shop to help homeowners feel less stressed. SERVPRO of Ebensburg understands there is a lot of stress that can come along with any kind of loss in your home. It is our goal to help minimize the interruption to your life and make everything "Like it never even happened." •SERVPRO of Ebensburg specializes in the cleanup and restoration of residential and commercial properties. •SERVPRO of Ebensburg can lower your stress by limiting the amount of contractors you have to deal with. •SERVPRO of Ebensburg also specializes in the reconstruction of your property after a fire or water loss. As a trusted leader in the restoration industry, SERVPRO of Ebensburg has highly trained technicians that are dedicated to responding to any size disaster with 24-hour emergency response. Contact us today, at 814-472-0800, to see what SERVPRO of Ebensburg can do to help you! Mold spores are always present in the air. The most effective way to avoid spreading mold is to ensure that conditions are not favorable for growth. Non-professional attempts to locate and remove mold are some of the most common reasons why mold spreads. Find out how spores travel and how to stop mold from spreading throughout a residence in Summerhill, PA. Mold will have a harder time growing in an inhospitable environment. Quickly mitigate and restore water damage and maintain relative indoor humidity levels between 30 percent and 50 percent. Contaminated clothes may be a factor in spreading mold. Pets also carry spores on their fur. Relocating a moldy item is another way that spores spread to other areas. Mold multiplies when moisture and food sources are present. If a leak occurs, mold may quickly spread throughout the affected area. Homeowners should take quick action to mitigate water damage and prevent the growth of any type of fungi, including black mold. All of these factors can cause mold to spread throughout a home in Summerhill, PA. Homeowners should arrange for professional mold remediation rather than attempting to locate or remove colonies to avoid spreading mold. Exposing hidden mold can release spores and spread mold rather than eliminating the problem. When it comes to keeping track of an insurance claim in East Conemaugh, PA, there can be a lot of details to remember. When your client is looking at water, fire, mold, or storm damage to their property, the restoration process can be complicated. Fortunately, the professional restoration service known as SERVPRO has a claims inventory system that can help. Here’s what you may want to know. Much of the data can also be organized by location, meaning that you can look up information by whether it falls under a regional, state or national category. In many cases, data can also be located by county. As the team collects the information needed for the insurance claim, they upload it to their corporate database. This information typically includes both the original estimate and any updates to the information that may need to be made. As an insurance provider, you can then access this information through the management dashboard. The dashboard allows the insurance agent to quickly access the facts they need to complete a claim. The ability to log in to the dashboard can help save time that might otherwise have been spent making phone calls, searching through paperwork, or seeking the right contact. This tool can also allow you to quickly look over the information needed to help answer any questions your client may have about their claim. When processing an insurance claim, using the claims inventory system provided by SERVPRO may help. The restoration team collects the information needed for the claim and then uploads it to the database. This allows you to easily access the data needed to process your client's claim. 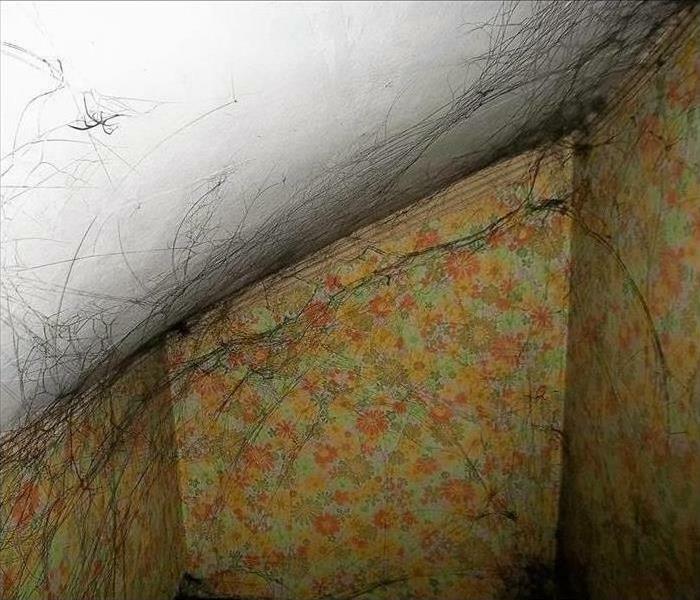 Soot webs in the upstairs stairway due to a furnace puff back in the basement. It doesn't get much worse than finally giving into turning on your furnace for the next few months and having it blow a whole bunch of soot back out through your entire home. The term "Puff Back" refers to the sudden explosion of soot into your home or business caused by a malfunction in the heating system. This soot is usually a sticky, greasy, grimy mess that can present a sever health hazard. All of those minuscule, oil based particles embed themselves in your curtains, carpets, and clothing while contaminating the air with known carcinogens. How Can I Know if I had a Puff Back? 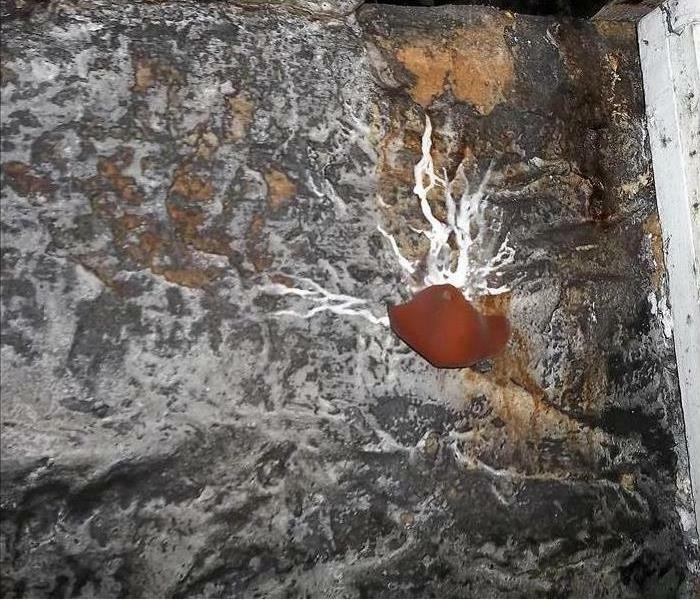 Puff Backs are characterized by the oily black soot left behind, often appearing like spider webs. The soot and other debris from the explosion can easily be carried throughout your home by the exhaust and heating systems meaning that every room in your home has the potential to be damaged. You might be tempted to try and clean up this mess by yourself, but running a vacuum over the soot only grinds it deeper and creates stains that will never come out. Wiping the soot from walls and ceilings creates a place where paint will no longer stick, and unless the soot is quickly and professionally removed, it can cause corrosion of metal on doorknobs, faucets, and even electronic equipment in the home. Because every inch of the home is affected, a puff back is an overwhelming job to clean properly. 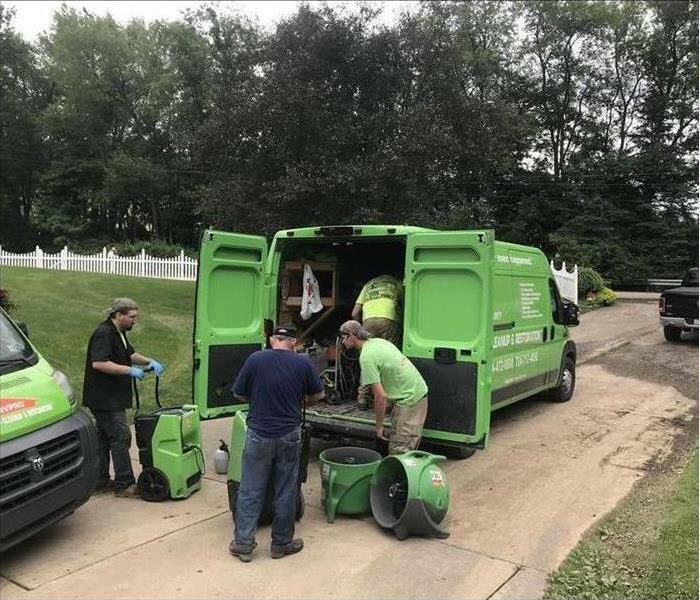 As a trusted leader in the restoration industry, SERVPRO of Ebensburg has highly trained technicians that are dedicated to responding to any size disaster with 24-hour emergency response. Contact us today, at 814-472-0800, to see what SERVPRO of Ebensburg can do to help you! Excess Moisture can Lead to a More Expensive Problem Quicker than you Think. Intrusion of water into your home or place of business can result in mold growth. Water intrusions can result from storm damage, plumbing or equipment failures, long-standing leaks and poor humidity control. When water intrusions are not addressed right away, the resulting damage can present increased risk of harmful mold growth. If the humidity and moisture levels in a water-damaged environment are not promptly returned to normal, mold spores may grow and multiply. Organic materials found inside a building, such as wood, paper, drywall and insulation, provide food sources for mold to flourish. Excessive mold growth can lead to indoor environmental conditions that pose a health threat. Thousands of people along the east coast had to deal with flash flooding in the wake of Hurricane Matthew. Hurricane Matthew hit the United States affecting states up the east coast from Florida to Virginia. With winds maxing out at 107 M.P.H, just short of 10 foot surges, and some areas getting over 7 inches of rain an hour, Matthew brought wide spread flash flooding and record river flooding as it worked its way north. SERVPRO of Ebensburg's Storm Team was just one of the many Storm Teams across the country to get the call to help those affected by Matthew. Our Team was sent to Raleigh, North Carolina , and then came back north to Virginia Beach, Virginia to help those that were dealing with sever flooding and power outages due to the hurricane. Now that water levels are receding, our team members are working long hard days in an attempt to help the residents of Virginia Beach get their lives back to normal as quickly as possible! 3/7/2019 - What Causes Mold To Spread?